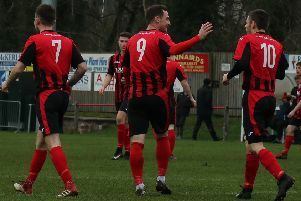 Two goals in stoppage time denied Dalbeattie Star a valuable win as they shared the points in a 2-2 draw with 10-man Stirling University in the Lowland League. All the good work of the previous 90 minutes was undone in a crazy three minutes as Star failed to cope with a couple of routine corner kicks to leave everyone in red and black totally deflated. The Star remain second bottom five points clear of Whitehill Welfare and six behind Vale of Leithen. Star began brightly and within a couple of minutes had two half chances, the first when Farrel O’Sullivan was just inches away from heading home Liam Park’s cross and seconds later when Scott Milligan broke through but the ball seemed to get stuck under his feet inside the penalty area. In the 26th minute the tide seemed to turn in Star’s favour when Matthew Burrows was shown a straight red card after an off-the-ball altercation with Connor Graham. There was a tangle of legs between both players and as play raged on Burrows appeared to stamp on Graham right under the nose of the standside assistant and the referee had no hesitation in brandishing a red card after a brief consultation. 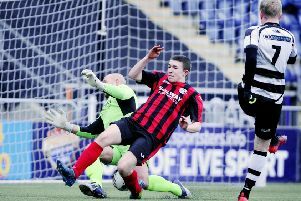 Just after the hour the home side had a big penalty shout when the ball struck the arm of substitute Ross Thomson but the referee correctly ruled it as ball to hand. The deadlock was broken when Lewis Sloan found Lewis Todd who had made a brilliant run down the right wing. He cut the ball back to Connor Graham whose shot was blocked but it fell perfectly for Milligan who fired home from six yards. With just three minutes left Star got their deserved second goal that looked sure to seal the much needed victory. After some controlled possession Star won the ball back deep in the students half and Milligan played in Irving. His first effort was blocked by a fine sliding challenge but Irving regained his balance and composure and slipped the ball under Walker. There was still time for a dramatic, and for Star, a heartbreaking finale. A corner from the left in the first minute of stoppage time was met by the head of Dominic Slattery and his header sneaked inside Parker’s right hand post. The unthinkable happened a few minutes later when the home side won another corner on the other side. Keeper Walker went up to lend his support but the corner looked too deep as it floated well past the back post, but it was knocked back into the danger zone and the ball eventually fell to substitute Aiden Ferris who volleyed home through a crowd of players. Only time will tell if Star will live to regret the two points they let slip at Forthbank. Next up in a busy spell is a visit from Kelty Hearts who Star met on the opening day of the season.